A modern clown entertains his audience by performing a provocative Comical Mystery. Like Jesus Christ before him, he redefines the notion of authority by giving a human dimension to the concept of miracles. 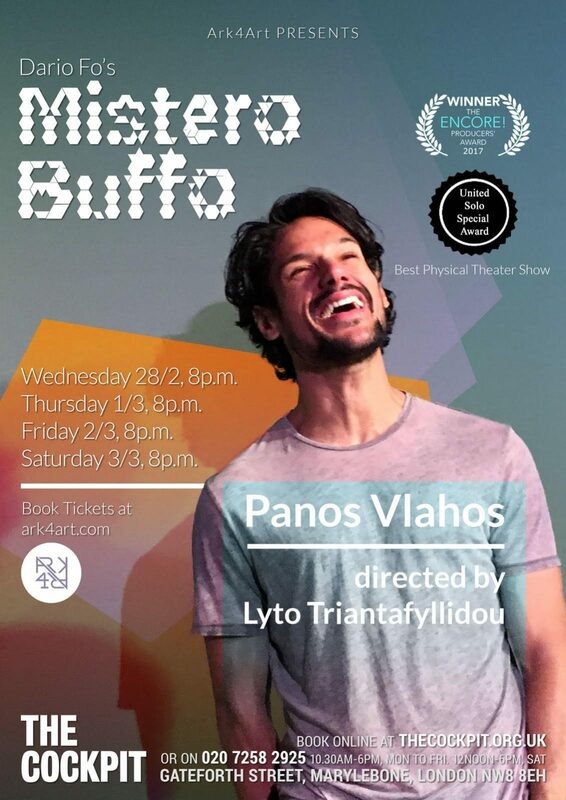 Directed by Lyto Triantafyllidou, acclaimed Greek actor Panos Vlahos will perform this new adaptation of Dario Fo’s Mistero Buffo for the first time in London. Mistero Buffo, written in 1969 by Nobel Prize winning playwright Dario Fo is a political exploration of popular Medieval Mysteries, consisting of several scenes re-imagining Biblical Stories and establishing new protagonists against religious rule. Dario Fo distorts popular religious stories, in order to further denounce the elite and historical establishment revealing the point where the human meets the divine. Triantafyllidou’s Mistero Buffo was first presented at the Balcony Theater at West Park Presbyterian Church in New York in May 2016. A second realization of the production was presented as part of United Solo Theater Festival winning the 2016 Best Physical Theater Show Award. In June 2017, Mistero Buffo started its journey around the world with its participation at the Hollywood Fringe Festival (Encore Producers’ Award 2017), at the Chicago Fringe Festival and Akko Theater Festival (Acre, Israel). who am I? who are you? who is in charge? The Giullare returns on the stage of Acco Festival of Alternative Israeli Theatre to invite its audience to challenge the puritanical stereotypes of religious traditions with laughter, giving a human dimension to the concept of miracles. Through spanning monologues, soliloquies, storytelling, dialogues and crowd scenes, the Giullare shares his revolutionary message and redefines the notion of order and power. The protagonist of this comical mystery finds his roots in the medieval jugglers and commedia dell’ arte, and as a genuine fool, voices subversive preaching with a chuckle! Actor Panos Vlahos uses his technical ease to perform a number of different characters as a fool, a player, a peasant, soldiers, villagers, the Pope and Jesus Christ in a one-hour theological and political statement.